Radiations of NARL ultrasonic wavs cause fat to be decomposed into the energy sources of free fatty acids and glycerol, but if that energy is not consumed through exercise after decomposition, the elements will combine again and will be stored as fat. 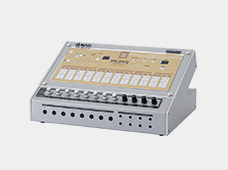 This machine burns free fatty acids effectively by exercising muscles through EMS during NARL radiation. 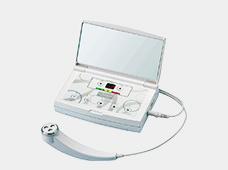 ■ NARL Ultrasonic encourages fat decomposition and the muscle exercise delivered by EMS encourages fat burning. You can focus slimming on one part of the body! ■ Available over the counter through the special health checkup guidance program! ■ Increased satisfaction because of comfort and being able to use NARL and EMS at the same time! ■ Effectively treat large areas using the linkable pads! ■ Increase fat-decomposing and fat-burning results by drinking the raspberry-aroma drink and using the machine! 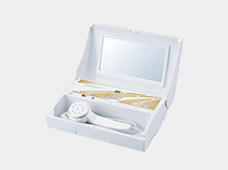 ■ Perform 32 ultrasonic treatments with the standard set of four L-Pads and S-Pads each! 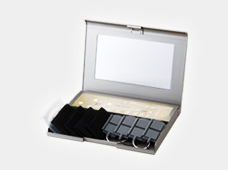 ■ You can add four L-Pads and four S-Pads with the optional pad set and increase the number of treatments to 64! It has been proven that normally the lipolysis hormone “noradrenaline," which is secreted from the sympathetic nerve endings by commands from the brain, is released locally by the irradiation of specific ultrasonic waves (frequency: 517kHz). Basically, it is muscle movement triggered by electrical signals sent from the brain. You do this continuously through your own will during normal strength training, but you were bothered by continuous pain that accompanies tired muscles. EMS treatment steps in at that point to make it possible to move your muscles through direct electrical stimulation to the muscles. EMS training has been widely used as a way to build up muscles without stressing joints and muscles. Top athletes have used it for muscle augmentation, and it has been used for skeletal muscle function recovery and other medical rehabilitiation; and for calorie-burning and other general fitness routines. The L-Pads are for large areas to be treated, such as the abdominal area or the thighs. You can enjoy even more effective treatment across a broader area by using these linkable pads. 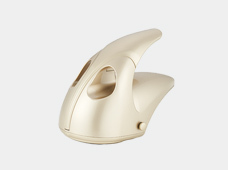 The S-Pads are for rather small areas to be treated, such as the upper arms or the face. You can enjoy even more effective treatment across a broader area by using these linkable pads. You can use these sheets to ensure that the NARL Ultrasonic’s tiny ultrasonic vibrations and EMS electrical stimulus is being passed on to your body. These sheets are very easy even on sensitive skin. *Water Gel Sheets are to be used once and thrown away. Flavor components including raspberry do more than capsaicin does for promoting fat-decomposition and fat-burning. Professor Kokyo Suzuki, MD of Kumamoto Prefectural University teamed up with our company to prove these results through research related to anti-obesity effects of combining raspberry flavor components with NARL ultrasonic waves.